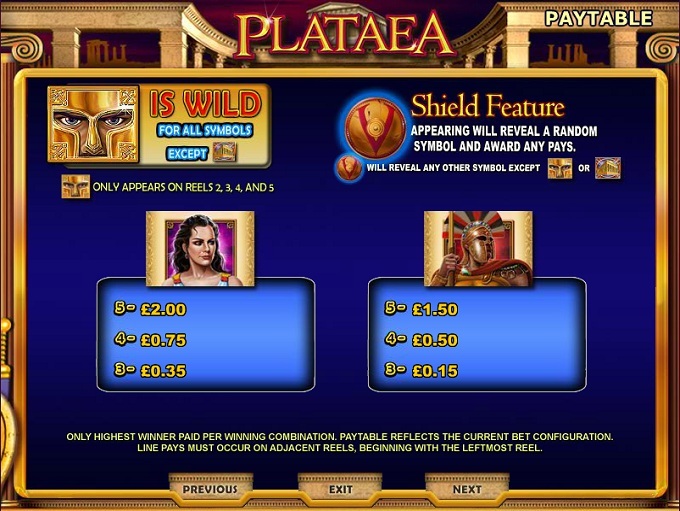 Plataea is a game that was inspired by the Ancient Greeks and their battles against the invading Persian Empire. WMS gives us in this game a bit of a history lesson as well, with the Plataea Battle being the one that decided the fate of the Persian invasion. On one side, we have Xerxes I of the Persians. On the other side, there is an alliance of Greek states, which included Athens, Sparta, Megara and Corinth. The final battle that decided the fate of the war took place in the vicinity of Plataea, a Greek city. The Greeks were victorious. 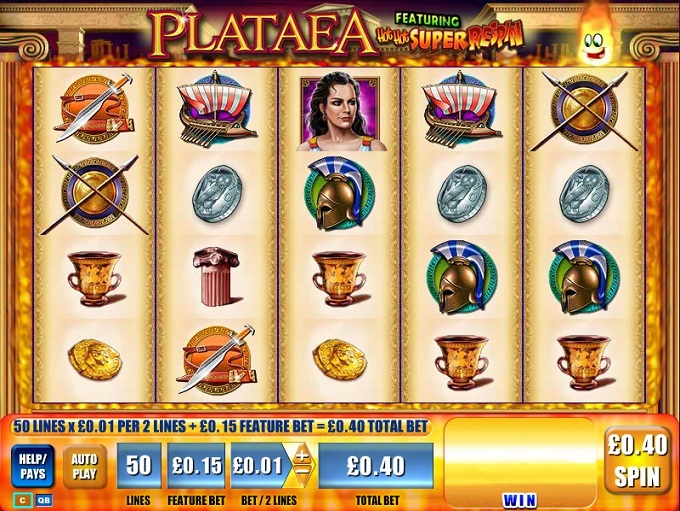 A total of 50 paylines are part of the 5 reels of Plataea. 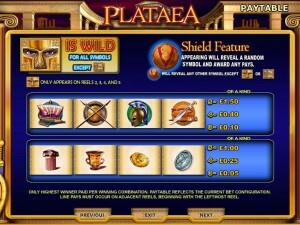 Among its features there is the Shield feature, wild symbols, a scatter and free spins. The top prize of only $1,000 is a very small reward in exchange for the big wagers that you have to use. Playing this game means that you also have a chance of triggering free spins, the Shield feature, getting scatters and wilds along the way. The Warrior’s Helmet is visible in the wild symbol, a close-up of the face showing only the eyes of the soldier, the rest being covered by the golden helmet. The Temple scatter can’t be replaced with a wild, but other than that you’re going to find that a wild will work in every case where it’s needed, if you have the rest of the symbols for the combo of course. Wilds appear on the reels 2, 3, 4 and 5. The presence of a Round Shield with a V on it will bring on a feature, where that symbol will turn into a randomly chosen icon, hopefully bringing you one or more wins. It can’t show you a wild or a scatter though. Another type of symbol that you can expect to get is the Temple, and it’s a scatter that has the ability to trigger free spins, and that’s about it. No cash prizes will be given by the scatter. The 1st, 2nd and 3rd reels are the ones that get Temple icons. 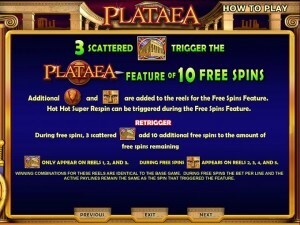 As always, 3 Temples are needed at the same time, scattered on the reels, to get you the 10 free spins that are present in the game. The advantage of these free spins, besides the fact that they don’t cost you anything, is that they have extra Shield and Wild symbols present, so your odds of making a profit go up. The betting system is somewhat unusual, with 25 coins being used to cover 50 paylines, and with an extra 15 coins being chosen to cover the feature bet. The total is 40 coins for a wager, with the value of the coins varying between $0.01 and $5. That’s a wager that goes as high as $200. Considering the kind of bets that you end up using in this slot, a 200 coins jackpot is hardly enough. The cash value would go only up to $1,000. 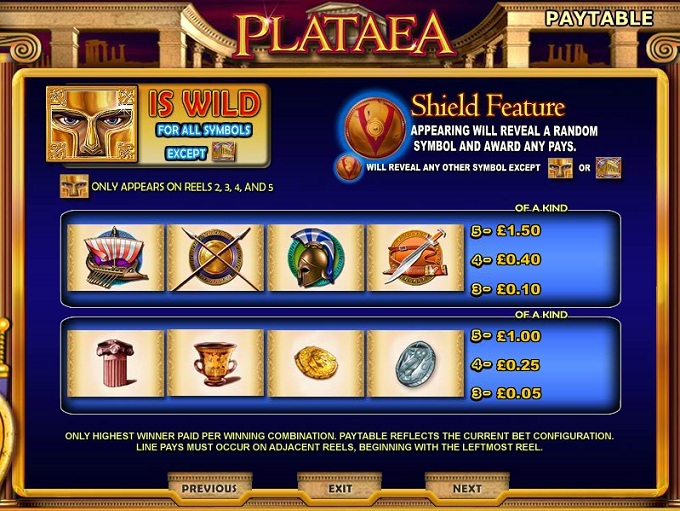 Ancient Greece serves as inspiration for Plataea, a slot machine that is about the war between the Greeks and the Persians. The symbols chosen for it are part warrior related, part things that were created by the Greeks (an amphora, a couple of coins, a marble column, etc). Due to the lack of any poker cards, the game is 100% themed and quite pleasant to play. Symbols: Warrior Golden Helmet (wild), Shield (bonus), Temple (scatter), Queen (200 coins), Warrior (150 coins), Trireme (150 coins), Shield and Spears (150 coins), Helmet (150 coins), Sword (150 coins), Pillar (100 coins), Amphora (100 coins), Gold Coin (100 coins) and Silver Coin (100 coins). The theme is popular enough, and you do get a lot of lines, but the rewards which only go up to $1,000 for a $200 wager don’t seem to be enough to make it profitable. 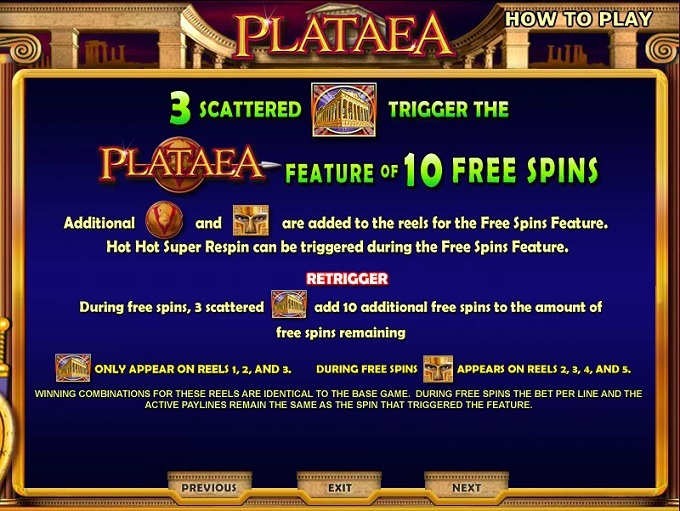 The Plataea slot machine is offered through the WMS platform, so if you want to play it for real or just to practice, look out for casinos that use it.